One of the many perks of working in fashion is I can very easily win arguments with myself about buying new clothes and accessories and make up - especially when they're our clients' brands. Oh, look at my bare wrist! Well, it will be bare after I take off my jade green bracelet which I faithfully wore for five years because Mum Pham gave it to me. Turns out, it's not a Phamly heirloom or even a gift. It's a piece of trash some one was about to throw out but Mum, the hoarder, salvaged it. Anyway, back to my bare wrist. I just have to get me a new Baby-G watch. You can't tell in the pic but the 11, 1 and 7 are painted onto the glass so it totally pops out. How white, how bright, how colourful, how me! I may or may not have also got me a new gold Casio vintage watch and Dad Pham coincidentally fell in love with a mens dress watch and it was nearly his birthday so Little Sissy Pham and I just had to get him an Edifice chronograph. Can't understand people who say they don't wear a watch because they have a mobile phone to tell time - watches just aren't about time keeping! My first blog comment - how exciting! I haven't worn a watch in years because i was one of those fools who used my mobile to keep the time. I got a Baby-G, which is the girl's version of G-Shock. 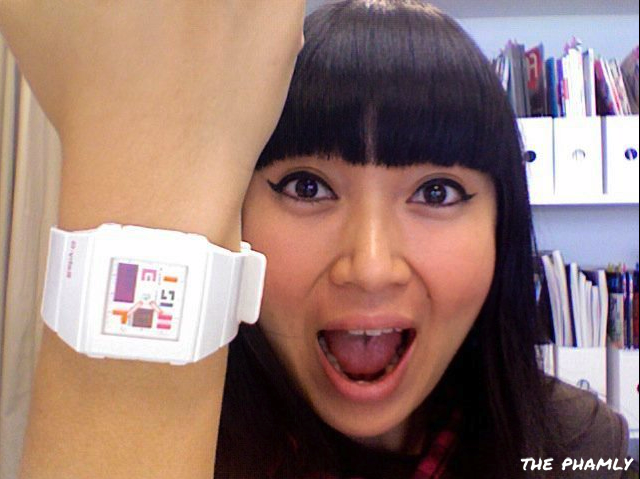 I'd wear a G-Shock if i didn't have tiny chick wrist syndrome. There's a bazillion* bright and colourful (and manly) G-Shocks out there. *bazillion may be slight exaggeration. I know this may be unmanly to say, but the mini-G looks better because it is less bulky. My favourite watches feel heavy on the hand, but don't look bulky (hence why I really like the Edifice, and my current 10 watches). I've just checked out the G-Shock website, and I prefer the G-mini much more than the regular G-shock. Haha! For shame Sean! For shame! You'll have to show me your watch collection one day. I love looking at stuff!